The Complete Multi-Media Birding Field Guide That Sings! 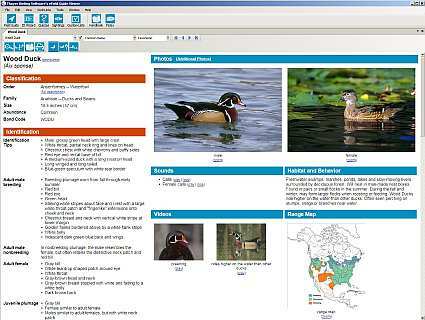 The ultimate software for birding enthusiasts of all ages! Guide to Birds of North America Version 7 USB Flash Drive Mac Edition (Also available in Windows Edition). Thayer's Birds of North America Version 7 USB Flash Drive, Mac Edition is an amazing birding resource covering 985 birds of North America. It includes 6,500 color photos, 1,400 songs, 550 videos and over 700 quizzes. This is a multi-media field guide for your computer that sings! Version 7 includes The Birder's Handbook in electronic format (a 750+ page book). This software runs on Mac applications. It comes pre-loaded on an 8 GB Flash Drive. Guide to Birds of North America Version 7 USB Flash Drive Mac Edition makes a wonderful gift for the birding enthusiast! System Requirements & Technical Support - This software runs on Mac applications. Technical support requires Internet access. Photographers: Rob Curtis, Kevin Karlson, Brian Small, Ron Austing, Mike Danzenbaker, Tom Vezo, et. al.